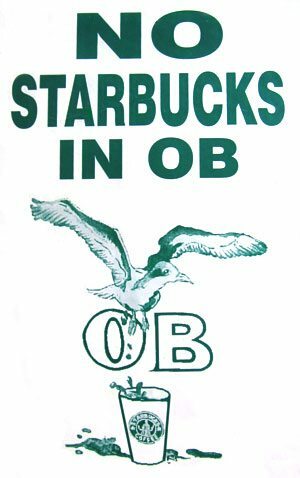 After five and a half months of organizing during the early months of 2001 against the opening of OB’s Starbucks, activists were ready for the day that its door would actually swing open. It was to open at the corner of Newport and Bacon. There had been at least three major demonstrations against the corporation where hundreds had rallied, two well-attended town hall type meetings, a petition that had garnered nearly 1500 signatures, and the handing out of thousands of fliers proclaiming a boycott of Starbucks. These all had been handed out at Farmers Markets and throughout OB. Activists were ready. They were going to be there when the doors opened with signs and petitions. Starbucks had announced that it would open its doors at 6:30 in the morning on September 11th. September 11, 2001. The day that history will always remember as “9-11”. The modern day of infamy. You could not have picked a worse day to do anything. Starbucks could not have picked a worse day of opening, and activists could not have picked a worse day of protesting. But how could anyone have known. The first group of picketers were there at 6:30 a.m. And they started picketing and chanting. The doors opened, the media – prompted by somebody on what was going to be happening on Newport – were there too, recording it all. Meanwhile, the rest of the world was watching in horror at what was going down in New York City and at the Pentagon. Thousands looked like they were dying. One estimate was maybe 20,000 were gone. But nobody told the picketers. As they moved back and forth in front of the store – they remained in the pre-9-11 headset. They hadn’t seen the live videos of planes flying into buildings. They hadn’t seen the explosions, the bodies dropping from the skyscrapers. They hadn’t shared those horrid moments that most of the rest of us now recall with a shudder ten years later. Earlier, in the pre-9-11 world, many OBcians had been supportive of the boycott, of the protesters. But this morning, it all changed. Young people would now drive by, and just simply screamed at the picketers. Others yelled at them to go home. It was as if the Starbucks picketers were the target of everyone’s anger and terror from that morning. Some in the media on site tried to show the protesters the videos or tried to explain to them what was happening. But there was too much tension, too much defensiveness, too much animosity. “We have a right to be here!” someone yelled back at those telling them to go home. “We have a right to free speech!” another picketer yelled. A few OBGO members even attempted to get the demonstrators to call it off. There was even yelling and arguments between activists. That morning the campaign against Starbucks had become irrelevant. Later, after the dust in OB had settled, those involved in the campaign had to figure out where they stood in this new reality. Two days later at the OBGO (Ocean Beach Grassroots Organization) meeting, a moment of silence was held for all those lost on 9-11. OBGO had been one of the groups responsible for helping to mobilize the community against the coffee giant, along with the Save OB Coalition. During the meeting there was still tension between activists, between those who had picketed and those who had tried to stop the protest. There was some discussion of the tragedy, some talk about a candlelight vigil, about a backlash coming against Arabs and Muslims. Then talk turned to organizing the boycott of Starbucks. A sign-up sheet for picketing was passed around. People were thinking of going to Starbucks on the upcoming National Day of Mourning and asking them to close for the day. There was going to be a “grand opening” on the upcoming weekend and people wanted to be there. One woman – a known local activist – complained of being hassled by police as she picketed outside. And picketing outside Starbucks continued that week. But there had been problems. At a meeting on September 20th of those involved in the campaign, a veteran peace activist had been invited to come and give us a list of the “do’s and don’t’s” while picketing to reduce negative contacts. Some had complained that others had been too confrontational while on the picket line. So, the sensitivity training proceeded in order to gear people up for further picket duty. We agreed at that point to limit picketing to Wednesday’s Farmers Market and to only picket in larger groups. Some thought we should document any police harassment of the protesters. A couple were to look into getting a video camera and have it available. By early October, the nation was at war. On October 7th, ‘America struck back’ – with cruise missiles and bombs being unleashed on the Taliban, Bin Laden and his friends in Afghanistan. For some of us – including me, the Starbucks campaign began to fade into the new reality. Other issues loomed as more important. 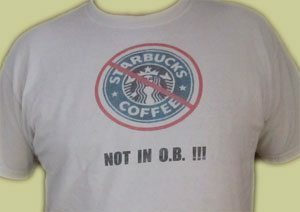 At the October 11th OBGO meeting, a new tactic emerged that would be used against future Starbucks and other chains. Activists wanted to draft an initiative for the OB Planning Board that would set up a blanket ban on all corporate chains that were headed to Ocean Beach. We had 90 days to gather 250 signatures to qualify the initiative for the Planning Board’s March 2002 election. A handful of folks were to meet with a local lawyer who would aid in drafting the resolution. And then it would be submitted for signatures. Not only that, but there was discussion of activists running for the 7 seats on the Planning Board that would be open next Spring. This new tactic would have a life of its own – and would be one of the centers of the focus of the anti-Starbucks campaign in the months ahead. The idea was to formulate a resolution that would be passed by the voters in OB, that would ban corporate franchises from setting up shop in town. Even if something like it passed, it would still only be an advisory ban. Activists were excited about this idea. A growing number of cities and towns are enacting policies that restrict the proliferation of “formula businesses” — stores and restaurants that have standardized services, décor, methods of operation, and other features that make them virtually identical to businesses elsewhere. Having saturated malls and other shopping areas, many formula retailers and restaurants are increasingly locating in downtowns and neighborhood business districts. Because they all like to follow one another, it’s not uncommon for formula businesses to arrive in an area en masse, squeezing out independents and causing a speculative run-up in rents that results in the wholesale transformation of a business district almost overnight. This can have long-term economic consequences as the downtown or neighborhood business district loses its distinctive appeal and no longer offers opportunities for independent entrepreneurs. Low-margin businesses that meet the basic needs of surrounding neighborhoods, such as grocers and pharmacies, may be pushed out as rents rise and the area attracts more formula restaurants and apparel stores. Perhaps of greatest concern, formula businesses tend to be fair-weather friends and can disappear quickly when the economy contracts or their corporate strategy shifts. To prevent and mitigate these problems, some cities and towns have adopted ordinances that prohibit formula businesses, cap their total number, or require that they meet certain conditions to open. A ban on formula businesses does not prevent a chain such as Starbucks from coming in, but it does require that Starbucks open a coffee shop that is distinct — in name, operations, and appearance — from all of its other outlets. Although there are a few examples of a chain complying with a formula business ordinance by opening a unique outlet, in most cases, they refuse to veer from their cookie-cutter formula and opt not to open. On another front, one of the things that everyone was told when Starbucks moved in, was that finally the place would be cleaned up. Yet, at the January 10, 2002 OBGO meeting, the observation was made that transients were still hanging out in front and on the side of the building. Meanwhile, a handful met with the local lawyer, a professor at a local law school. He came up with language for the draft that would exclude those chains – especially restaurant-types – that employed the same logo, wares, services and foods of their mother company, and who were corporate giants. By then the required number of 250 signatures on the Formula Chain initiative had been collected and turned over to the Planning Board. It appeared it would be on the Board’s March election ballot. And there was more talk of OBGO activists running for that Board. Two weeks later, organizers of the local boycott heard that there was going to be a national day of action against Starbucks organized by a group called Organic Consumers. This national day would occur some time in late February or early March. This was indeed inspiring news to those committed to stopping the company here in OB. Since March 2001, thousands of activists have taken part in protests and leafleting events outside Starbucks cafes in over 300 cities in the US, Canada, New Zealand and England in what has become the largest consumer campaign ever mounted against a major US food and beverage company around the issues of genetic engineering and Fair Trade. It felt good to be part of a wider crusade than just the local one. In mid-February, the campaign heard the good news: the Formula Ban initiative had collected 476 signatures of which 379 were valid. So, it was a done deal – the initiative would be on the Planning Board ballot. Near the end of February, in conjunction with the national campaign against the coffee company, there had been a small demonstration in front of Starbucks – this was five and a half months after its opening. Twenty protesters had been there, and it was reported that there had been 10 cops present as well. But there had been a good response from people passing by, we were told. We had also heard that six homeless people had been arrested for sleeping on top of the building’s roof. At the February 28th OBGO meeting, there was discussion of having a one year anniversary demonstration in front of Starbucks storefront. The first protest had been on March 25th, 2001. Plans were being made to have another on March 23rd this year. A flier was drafted that explained why buying local was better for the environment, and the flier also included a list of local businesses that supported the boycott against Starbucks. We had heard that the company wanted to open 1200 new stores over the next 5 years, and they wanted to move into the South American and Mexico markets. Plus, Starbucks on Newport Avenue was seen measuring for a new sign. This was significant because at a meeting between Starbucks officials and activists at the Green Store back in 2001 before they opened, they had promised not to install one of their large, signature signs. Now, it appeared, that deal was off. 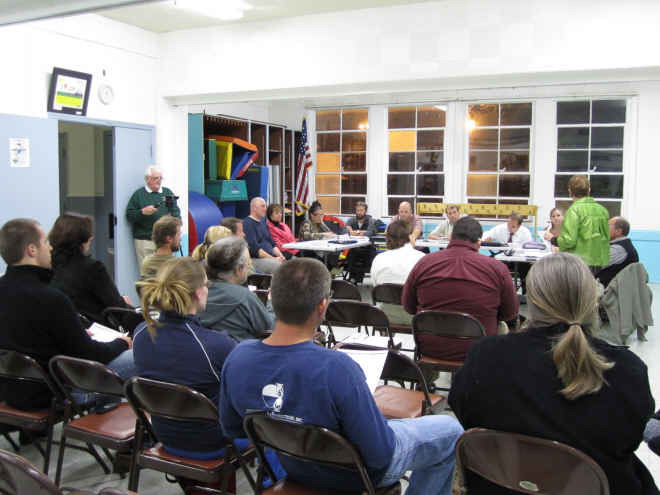 On March 12th, the Ocean Beach Planning Board held its annual election. Five OBGO candidates were elected or re-elected to the Board. They included Kip Kruegar, Kim McGinley, Doug Zilm, CT Krause, and myself. Dan Morales, also an OBGO member, was already on the Board. This meant that OBGO had six of its members in seats on a board that only had eleven, so we had a majority. I was elected Chair with those 6 votes. Doug was made vice-chair and Kim secretary. The big news of the election – besides OBGO’s sweep – was that there had been a resounding victory for the Formula Ban – which on the ballot was entitled Prop A. With this vote, the Planning Board had seen the largest turnout in years – principally because of OBGO’s mobilization of its supporters and the counter mobilization of those who didn’t support Prop A. All told, Prop A received 143 votes (77%) and there had been 42 votes (23%) against it. Near the end of March, on the 23rd, the year anniversary of the first protest was held in front of Starbucks. People who organized it felt it had been a good demonstration, that there hadn’t any polarization, and that the anti-Starbucks efforts were being accepted by OBcians again. There had been a number of new faces and decent coverage by one of the TV stations. Part of the reason locals were so against Starbucks was due to the perception that if allowed, its presence on Newport Avenue would cause other property owners to raise their commercial rents. As if to highlight this threat, the owner of the property where the Newport Pet Shop had been for 30 years, had raised the rent from $2500 a month to $4500. The pet store owner had erected a large banner across his front window screaming out this outrage. This kind of news drove us crazy. It couldn’t be happening – everybody loved that shop, and the personal attention the pet store owner gave his customers was remarkable. He was so low key that he didn’t even use a regular cash register, but just had one of those electrical calculators. He had announced that he was going to close his shop in October. Here, clearly, was a victim of a “new” wave on the main street – a new wave that we felt had developed because of the “success” that Starbucks had accomplished. This new wave promised to change the character of Ocean Beach. I was at the meeting at the Green Store. Although we felt Starbucks officials weren’t being totally up front with us regarding their lease status, they did tell us because of our concern they would not put up the big block letters you see at most of their other stores. So far they have kept their word. To me this was significant because their presence is much more low-key. Great account of the events of only a few years ago, lest we forget our own modern history. 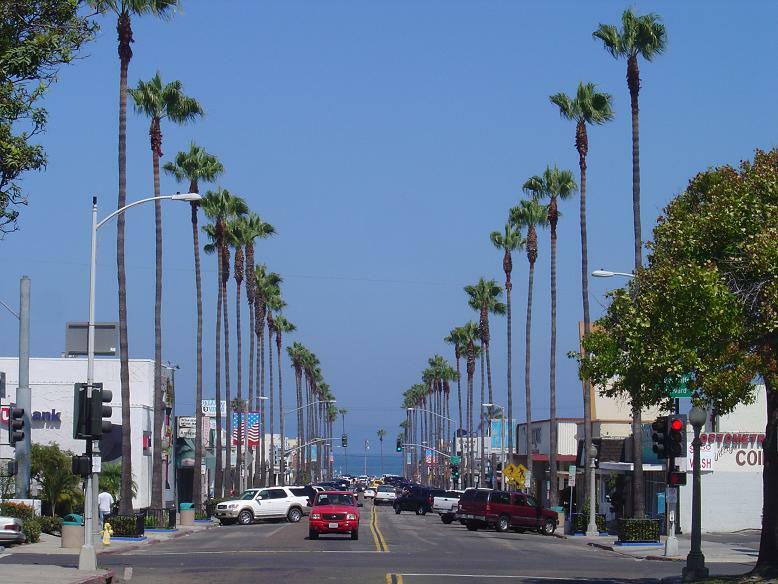 Now, there is a 4th part to this story, one that might be less history and more analytical of the business climate of Newport Ave (and all of OB) that begs to be authored. Not to second guess the boycott or the protests, but to really look at the effects and document either the rising rents on Newport Ave or whether or not OBceans vote with their pocket books or with their raised fists (or if they vote at all!). Can we get a sit down with the Starbucks manager and get some feedback on what exactly THEY do for the community (if anything?). Do they sponsor a little league team, host clean ups in that dirty alley behind their building, hire a lot of hard working high school students? Perhaps also a follow-up, or “where are they now”, about local activism, organizations and the political arena of OB. I love to comment on the local politics and the OBGO came as close to a political grassroots “party” as we’ve ever had on the Point. Unfortunately…OB-GO….turned into OB-went. Who are my upcoming grassroots candidates to support now? It’s always campaign season somewhere, and I’m sure that either the Town Council or the Planning Board have elections just around the corner! The voting in the reader poll clearly shows that people are interested in the issue – 123 votes (as of the time of this post) might even rival the voting for the future Mayoral campaign. Hey Frank….give’em what they want! You’ve got more to write! Thanks, there is a 4th and final part to my series. Please wait with baited breath. OBLaw – you made some great suggestions, and I don’t know if I can fulfill all of them. Wow I did not fully realize the full impact of the Starbucks. How many business’s were affected and what were the names , And how many closed totally ? I read a lot of paragraphs and not a lot of specifics …. Names , addresses and dates will be more than helpful. However if i hear ” you just don’t get it ” OR ” wooossh thats the sound of the facts screaming past your head” I will consider all the above paragraphs just word’s and no real facts. reason locals were so against Starbucks was due to the “PERCEPTION” that if allowed, its presence on Newport Avenue would cause other property owners to raise their commercial rents.” Then Frank mentioned ONE, place that experienced a LEASE HIKE was the PET STORE…. This “COULD” have been purely coincidental…. However, this belief is probobly true….. I never knew it was September 11th 2001. Was an interesting historical tidbit.